The ill-fated simian gets a decent burial by the railway tracks in Na Jomtien. 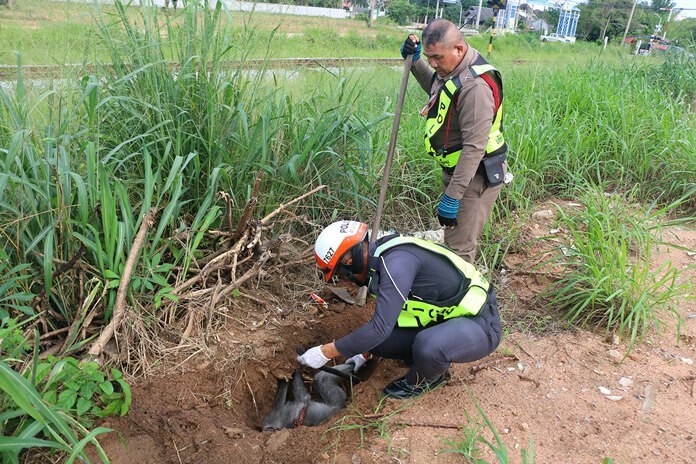 A Na Jomtien police officer laid to rest a monkey that had been hit by a car in the Sattahip sub-district. Pol. Sen. Srg. 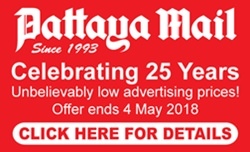 Maj. Ongart Chanapia and police volunteer Num Mokhaow collected the carcass of the dead simian May 5 after it was struck by a car on Sukhumvit Road near Nong Nooch Tropical Garden. The two men impressed nearby residents when, after checking it indeed was dead, took the animal to a seluded area by the railway tracks and buried it. Witnesses said many monkeys sit on trees and cables in the area, but one had come to the ground and was hit by a white car. Locals said they appreciated the officers’ consideration.